This is the same mechanism, that can also be observed in inland waters and is described as the “nitrogen cycle”. 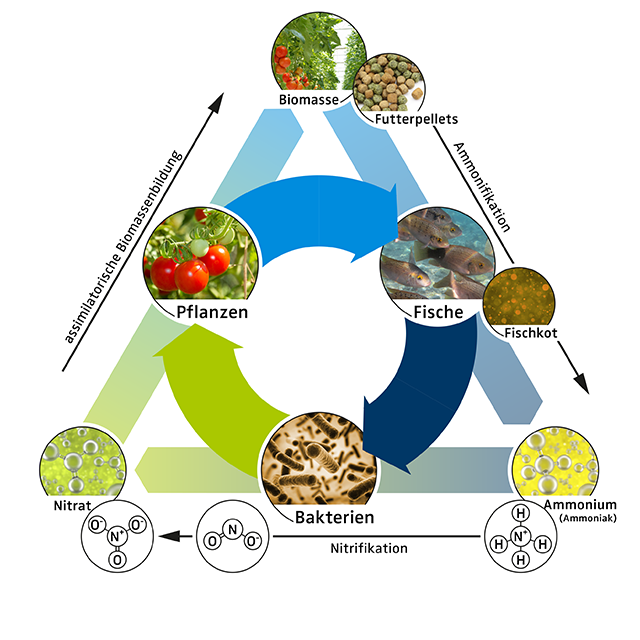 Contrary to conventional agriculture, which always uses only a small part of this nutrient cycle, the complete biocircle is represented within aquaponics. Compared to nature, this corresponds to a complete ecosystem, such as a lake. In the center of aquaponics is the nutrient cycle between fish and plants. In addition to fish and plants, bacteria play an important role. They prepare the excretion products of fish for the plants by converting them into plant fertilizers. The absorption of the nutrients by the plants and their biomass formation removes the nutrients from the water. This results in the clarification of the water. Up to now, classical agriculture only uses sections of the entire nutrient cycle. It is mainly based on feeding fertilizer (and other substances) to the plants. In contrast, an essential quality of aquaponics is that it maps the entire nutrient cycle. In doing so, aquaponics understands the also surrounding processes and the exchange of technical or biological substances as part of the cycle. Therefore, the components of an aquaponic plant are not restricted to modules, that allow these basic procedures. Aquaponics can be complemented by a multitude of related processes and seamlessly integrated into other sustainable technologies. For example, aquaponics can make great use of biogas plants. In addition it can produce other by-products such as worm cultures or humus production. It can even be in symbiosis with them, for example, when insect production is used to produce the fish fodder. Aquaponics is an open concept and can be very diverse. For example, aquaponics can be realized as fresh water or seawater aquaponics. In addition to fish, it can also be operated with invertebrates (shrimp / mussels) together with algae.